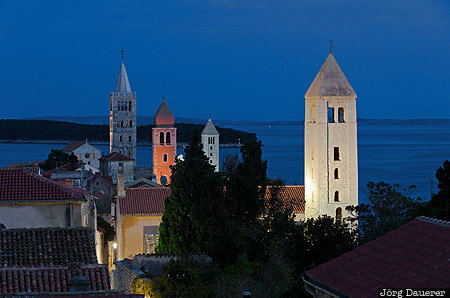 The flood-lit towers of the town of Rab at the blue hour with the Mediterranean Sea in the background. The town of Rab is on the island Rab in Primorsko-Goranska in the north-west of Croatia. This photo was taken in the evening of a cloudy day in November of 2014. This photo was taken with a digital camera.